I got this snazzy little book 2 Christmas's ago. I've never been able to keep up a journal or anything of the sort. Though I'm on my second year of this journal and going strong! I am always making lists and leaving myself notes and I have never been able to keep up with a diary. THis would be perfect for me! wow this is the best idea ever! 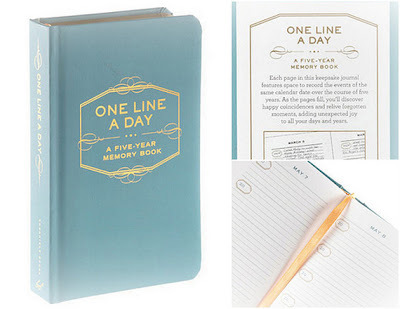 i really want to get one because i am exactly like you...i always have the intension of writing a diary but that only lasts for a few days. Good to know I'm not the only one making lists of all kinds of things. That notebook is so cute! I love making lists too. That book is such a clever idea! Wow, I love that! What a great idea and what a cute little book! this is SUCH a good idea!!!!! I used to be SO good at keeping a journal...ehhh not so much anymore! Its so important tho! I just found your blog...I LOVE IT! I love this idea. Kind of a diary for easily distracted people (like me). this seems like such a great idea! how much was it?? Hi Jinling Jade - I paid £9.84 plus postage, which if you split the cost over five years works out to be £1.97 a year. Bargin!!! Thanks for all of your great comments.